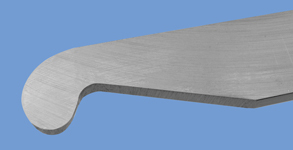 These scrapers are used for undercutting rims of bowls and for small closed hollow forms. The Hooked Scrapers are good for smoothing the upper shoulder area of vessels. The wider shank sits flat on the tool rest to resist radial torque during use. Made of M2 high speed steel, each blade measures 1" by 6-1/2" by 1/4" and has a 10" Ash Handle. The shank tapers 2-1/2" from the end to allow access through a limited opening. We offer two different shapes of Hooked Scrapers. One with a 1/4" diameter end and the other with a 1/2" diameter end.